Kyle: Since I haven’t played Battle for Sularia I have to ask, is this stand alone expansion a good place to jump into the game? Jesse: It’s a great question, and we think so yes. Purchasing just Reign of Terror: The Protoan won’t give you enough decks to share with your friends as well though. It just lets you jump into already established game groups without needing past cards. 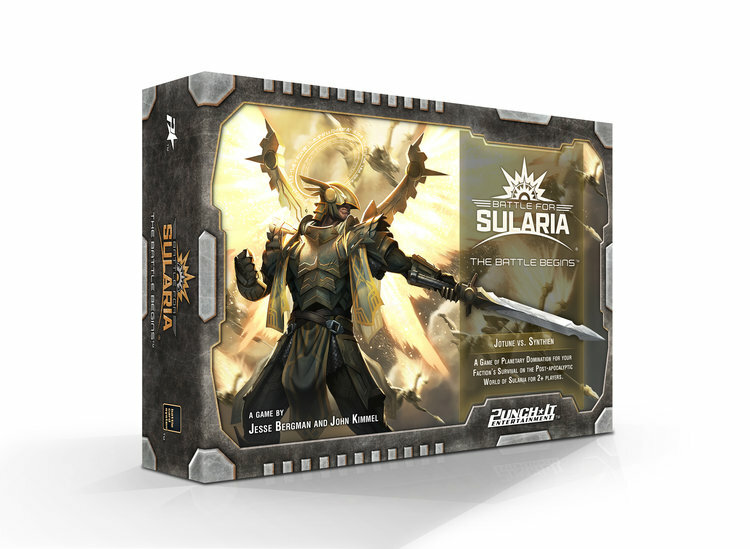 If you and your gaming group are totally new to Sularia then our all-in-pledge is an excellent way to start as you get 344 cards to build your decks spread across three different factions. This was the one of the most difficult things to figure out as we moved forward in development of this title. How do we support existing players and player groups, while making it accessible to brand new players and groups? Kyle: This actually leads us right to our topic today. You mentioned each player needing their own deck, which is a different model than many board game hobbyists are used to. However Sularia is not a Collectible Card Game (CCG) like Magic the Gathering either correct? Jesse: Correct, CCG’s or Collectible Card Games, deliver content to their players through randomized card booster packs and fixed “starter decks” and they have some interesting effects on buyer psychology. What ECG’s (Expandable Card Games) do is release content in fixed configurations of cards. Take for example Battle for Sularia’s first release called The Battle Begins. It features 45 unique cards in a complete play set of 4 cards for a total box size of 180 cards. This ensures that players are always getting all the cards and that the game comes down to player skill and of course luck of the draw. Fantasy Flight created their own term for these games called Living Card Games, but since they own the rights to the term we and others cannot use it in marketing or to talk about our games. Fantasy Flight takes the approach of including more cards in a core set but they do not provide a full play set, so the deeper you dive into a particular game the more likely you’ll want to purchase 2 or 3 core sets. Kyle: So as a relative outsider to this particular niche in the tabletop hobby, these games seem like they lie somewhere between CCG’s and your typical tabletop card game. Jesse: Good question, and one that makes for an interesting answer. I want ask you, as outsider to strategy card games, what do you consider a typical tabletop card game? Kyle: To draw some generalizations, while I’ve never been a CCG player it is hard to be a tabletop gamer and not bump into that aspect of the hobby. Most card games I would purchase would be a single box where everyone in my group could play. You’ve got your deck builders, set collection, trick taking and so on. But the idea of an ECG seems to blur these lines a bit. Jesse: They do I suppose when coming from your perspective. From my perspective those games take a lot of elements from traditional CCG’s. Set collection is just a game centered around drafting packs in a CCG. Deckbuilding is essentially a version of drafting cards from a pool of cards, laid out in packs in front of the players. The packs are typically only one card but the premise is the same. And we are building a deck but doing it on the fly in the game. In some ways an ECG is just an extension of a CCG with one key difference. The elimination of packs. Many of of those elements came from far deeper back, like pitch, spades, etc… using a traditional poker deck. I’m sure those games had subconscious influences on modern ECG’s and CCG’s. Kyle: This sound like an interesting tangent. Can you give any examples of how the traditional poker deck has influenced modern strategy card games? Jesse: Yeah, the easiest correlation is combination decks. Some combo decks in games like Magic allow the player to take infinite turns and win the game. In many ways this is like building the royal flush in poker. It’s the trump hand to win the game. Having a pair of the same cards in a CCG is powerful but not always a way to guarantee a win. Additionally CCG’s and ECG’s have a metagame that occurs separate from the game that incorporates bluffing and watching your opponent for tells. When you become a master at the game, you also begin calculating your opponents plays. In poker this is done through betting and checking. In ECG’s this is done through potential odds of having a specific card for a specific play scenario. Kyle: Now that we’ve touched a bit on what sets the strategy card game genre apart from the rest of the tabletop hobby, perhaps you could share some perspective on these differences between CCG’s and ECG’s? Jesse: Well the first thing, which we touched on before, is the random packs in a CCG. ECG’s have a fixed distribution system. This means that players will have all the cards as long as they’ve purchased all the expansions. To us here at Punch-It Entertainment, this was a huge deal as it put everyone with the game on an equal playing field. I recently read how Richard Garfield, designer of Magic the Gathering thought the average player would only spend $100 on Magic, so in the early days they made fake packs and limited the card pool because they never thought players would collect full play sets of each release. Obviously, they were very wrong, but being wrong in this way was very good for their bottom line. However, early Magic had some serious balance issues related to this misconception. With ECG’s you have to equip your play test group with the most competitive and best card players you can get your hands on. With this approach we’ve be able to balance the game at the highest levels possible, because we know every card is accessible. It takes a ton of time and energy to do this, but we feel it’s super important to the overall quality and experience players will have with the game. Kyle: I would venture a guess that part of the draw for CCG players is the randomized packs. Does this impact the direction you take an ECG at all? Jesse: Yeah definitely, I can’t find the source for the study, but at one point I remember reading that opening booster packs provides a hit of dopamine. It’s what creates a “need” to open more packs. It’s definitely a major concern when making ECG’s and why up to this point not a single ECG has established a player base like Magic. FFG’s Netrunner game may be the largest with the largest Netrunner group having 3.9K users. In comparison, Magic’s primary Facebook group has 218K. We didn’t fully comprehend this until after Sularia had funded the first time. Because of this we’ve shifted our focus to rapid content deployment and are even beginning to look at cosmetic add-ons to the game that are randomized. We haven’t seen anyone doing a loot box type model in the space as of yet. We feel this may help bridge the gap a bit and since the cards are purely cosmetic, it won’t impact gameplay or balance, but can potentially provide a true booster pack method to draft. Kyle: That sounds like a very interesting approach to the chemical reward from randomized rewards. I have a question from Tyson on Twitter that I feel like you just started to answer. Jesse: It’s a excellent question from Tyson, and I’ll do my best to answer it. All of the above are important which makes the genre that much more challenging as an indie developer. You need to have artwork that is on par with those other games mentioned, your gameplay must be well balanced, and you have to be pushing new packs out as frequently as you can. One thing many won’t consider is how people learn your game. In Magic there are a number of players who have never read a rule book or watched a learn to play on YouTube. They are taught by friends in the Magic community. When you are new that luxury is not available and so an easy to use and read rulebook becomes priority number 1. These kinds of games traditionally have long rule books in comparison to other strategy card games and board games. The new Legends of the Five Rings LCG has a 36 page learn to play manual, and a completely separate rules reference guide. As far as how to compete, I believe that is what many are trying to crack. FFG hasn’t done it yet and we certainly haven’t either. But I do think eventually the magic formula will be found, pun intended. Right now many people I think automatically associate card games to Magic the Gathering in one way or another, which can lead to both good and bad assumptions about your ECG. Kyle: Speaking of competition, Jade Owl Studios has asked how you plan to compete with bigger companies like FFG and their established games? Jesse: Good question obviously FFG has awesome games with great intellectual properties. When I was looking for a new card game I turned to the Netrunner LCG in 2010 or 2011? I can’t remember exactly when that was, and then I transitioned to Conquest. As a long time card player I liked both of these games but they didn’t feel like CCG’s to me. Instead I felt like I was playing a board game in terms of mechanisms and player interactions/metagames. Obviously many people love those games, but I felt like it left the market wide open for an ECG that played more like a traditional CCG. Coupling that thought, we felt we could evolve those older designs and help improve on some of their potential shortcomings like resource issues, first player advantages, and power creep. A Robust Alpha Program. Monthly packs released without illustrations that are nearly complete in testing, and mechanically functional. These are available as a free download. A Tabletop Simulator mod to help remove geographic borders. A Deck Construction System that really makes each card have meaning and value when building a deck. Of course we have a few more things up our sleeve we can’t reveal quite yet which should come to light in Q2 of this year. One final point, as mentioned before we supply complete play sets of our cards and come in a more affordable package than our LCG competitors. Kyle: It sounds like you have a lot of great things coming down the pipeline. As someone who has never taken the plunge into a CCG or ECG, what am I missing out on? Jesse: Yeah I love this question! I believe you are missing out on games that are infinitely different every time you play them. ECG’s offer a truly unique experience and when you take a given snapshot of the game your cards in play, your cards in hand, your opponent’s cards in play, and your opponent’s potential cards in hand all equate to a puzzle where you must make the best decision possible while having imperfect information. It’s really quite fascinating and thrilling. Playing in high level tournaments really does get that adrenaline going, especially the further you progress into that tourney. Kyle: Do you hold any tournaments for Sularia? Jesse: We do for sure, currently we run tournaments at local game stores and conventions we attend. Additional we run a national tournament and hold it in Lincoln, Nebraska our hometown. Finally we are now launching tournaments leveraging Tabletop Simulator. We will be announcing more soon on how to become a T.O. or tournament organizer. Kyle: Before we wrap up, could you tell us how you got started making games? What brought you to creating Sularia? Jesse: I started making games a a young boy. I submitted my first game design to Nintendo Power when I was something like 8 or 9 years old. As a teenage I turned to making games by being a game master for a Mechwarrior and Rifts RPG System. I completed my schooling at UAT in Tempe, Arizona earning a bachelors with honors in Game Design. Games have always been part of my life and as an adult I wanted to try and turn it into a career. Creating Sularia was not a straight forward progress and a very long story. It basically started when John Kimmel, my long time friend, co-founded Punch-It Entertainment. We set out to start making video games and during a prototype session for a video game we realized we were having a ton of fun with this game as a board game. While that game has been shelved and won’t probably ever return, its failure in testing had me digging back in to my old college design notebook, where I had a one page design with this basic pitch. I believe the published version of Sularia meets almost all of the initial vision, and has become so much better because of all the great people that have been involved in making it. Kyle: Final question, what is your favorite tabletop game (that you didn’t make)? Jesse: Good question, for me it’s probably Istanbul. I love the worker mechanism in that game and really enjoy the simplicity of the rules and all of the complex strategies and paths that emerge from the ruleset. Kyle: Thanks Jesse for joining me for this discussion. I’ve learned a lot about ECG’s and their place in the hobby. Good luck with this latest Kickstarter! Jesse: Thanks Kyle, we had a ton of fun talking card games, and can’t wait to see more great content from you!